The stars were battling each other in a gravitational tussle, which ended with the system breaking apart and at least three stars being ejected in different directions. 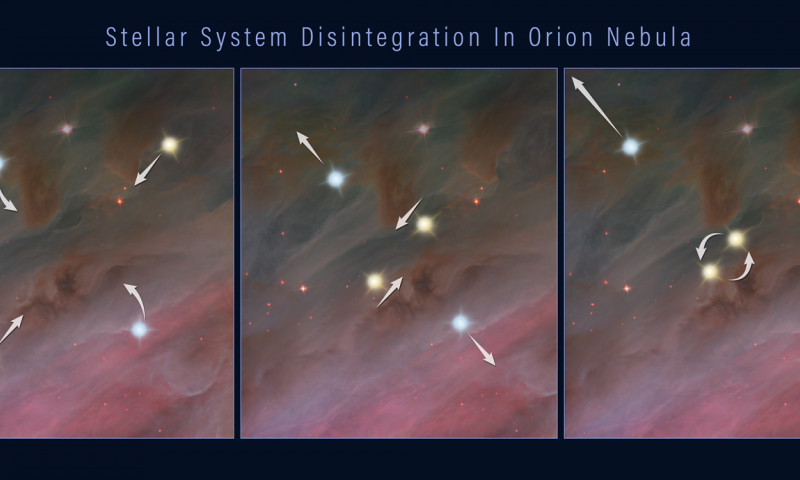 The speedy, wayward stars went unnoticed for hundreds of years until, over the past few decades, two of them were spotted in infrared and radio observations, which could penetrate the thick dust in the Orion Nebula. The observations showed that the two stars were traveling at high speeds in opposite directions from each other. The stars' origin, however, was a mystery. Astronomers traced both stars back 540 years to the same location and suggested they were part of a now-defunct multiple-star system. But the duo's combined energy, which is propelling them outward, didn't add up. The researchers reasoned there must be at least one other culprit that robbed energy from the stellar toss-up. Now NASA's Hubble Space Telescope has helped astronomers find the final piece of the puzzle by nabbing a third runaway star. The astronomers followed the path of the newly found star back to the same location where the two previously known stars were located 540 years ago. The trio reside in a small region of young stars called the Kleinmann-Low Nebula, near the center of the vast Orion Nebula complex, located 1,300 light-years away. "The new Hubble observations provide very strong evidence that the three stars were ejected from a multiple-star system," said lead researcher Kevin Luhman of Penn State University in University Park, Pennsylvania. "Astronomers had previously found a few other examples of fast-moving stars that trace back to multiple-star systems, and therefore were likely ejected. But these three stars are the youngest examples of such ejected stars. They're probably only a few hundred thousand years old. In fact, based on infrared images, the stars are still young enough to have disks of material leftover from their formation." All three stars are moving extremely fast on their way out of the Kleinmann-Low Nebula, up to almost 30 times the speed of most of the nebula's stellar inhabitants. Based on computer simulations, astronomers predicted that these gravitational tugs-of-war should occur in young clusters, where newborn stars are crowded together. "But we haven't observed many examples, especially in very young clusters," Luhman said. "The Orion Nebula could be surrounded by additional fledging stars that were ejected from it in the past and are now streaming away into space." The team's results will appear in the March 20, 2017 issue of The Astrophysical Journal Letters. Luhman stumbled across the third speedy star, called "source x," while he was hunting for free-floating planets in the Orion Nebula as a member of an international team led by Massimo Robberto of the Space Telescope Science Institute in Baltimore, Maryland. The team used the near-infrared vision of Hubble's Wide Field Camera 3 to conduct the survey. During the analysis, Luhman was comparing the new infrared images taken in 2015 with infrared observations taken in 1998 by the Near Infrared Camera and Multi-Object Spectrometer (NICMOS). He noticed that source x had changed its position considerably, relative to nearby stars over the 17 years between Hubble images, indicating the star was moving fast, about 130,000 miles per hour. The astronomer then looked at the star's previous locations, projecting its path back in time. He realized that in the 1470s source x had been near the same initial location in the Kleinmann-Low Nebula as two other runaway stars, Becklin-Neugebauer (BN) and "source I." BN was discovered in infrared images in 1967, but its rapid motion wasn't detected until 1995, when radio observations measured the star's speed at 60,000 miles per hour. Source I is traveling roughly 22,000 miles per hour. The star had only been detected in radio observations; because it is so heavily enshrouded in dust, its visible and infrared light is largely blocked. The three stars were most likely kicked out of their home when they engaged in a game of gravitational billiards, Luhman said. What often happens when a multiple system falls apart is that two of the member stars move close enough to each other that they merge or form a very tight binary. In either case, the event releases enough gravitational energy to propel all of the stars in the system outward. The energetic episode also produces a massive outflow of material, which is seen in the NICMOS images as fingers of matter streaming away from the location of the embedded source I star. 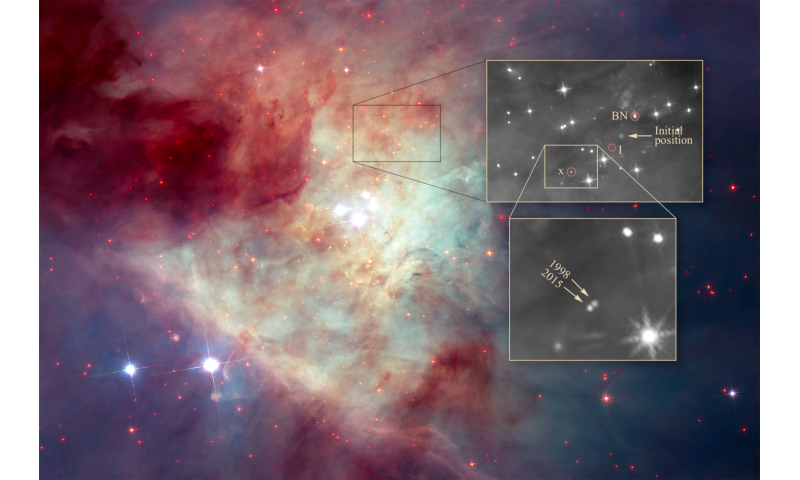 Future telescopes, such as the James Webb Space Telescope, will be able to observe a large swath of the Orion Nebula. By comparing images of the nebula taken by the Webb telescope with those made by Hubble years earlier, astronomers hope to identify more runaway stars from other multiple-star systems that broke apart. "Birkeland currents align themselves with the ambient magnetic field direction ... And in laboratory z-pinch experiments, the plasma tends to form a number of 'beads' along the axis (see HH34 above), which 'scatter like buckshot' once the discharge subsides." 3- why should anyone take you serious when you can't provide science or legitimate source material and your other tactics are to simply regurgitate a random gish-gallop lie-fest, then repeat ad nauseum all over the net? "why should anyone take you serious"(ly), if you do not know how to use adverbs and apostrophes or to debate without offense? It's mindless, repetitive and arrogant. Captain Stoopid in a nutshell, that's why he's been blocked for 2 years now. I'm pretty sure, you still didn't visit any mainstream physics forum. The PhysOrg is still relatively liberal site (if we subtract Stumpy and few of his socks). Anyway, his time is nearing to end. Re: "Anyway, his time is nearing to end." We're enlightening the next generation while the ignorant, outdated, mindless, repetitive, and arrogant, individuals such as jonesdumb and Cap'n Stoopid will soon be dead and in the ground along with their failed guesses. (if we subtract Stumpy and few of his socks). Anyway, his time is nearing to end. so all the idiot trolling conspiracy nutters and pseudoscience f*cks are going to start a killing spree? nice of you to advertise it - but you don't have the cojones to even try to face anyone with your BS crap... so what makes ya think you are capable of anything worse? because trump will support you? What I can see is mentally ill guy - isn't it quite apparent? Mass shooters are product of ignorant society, who overlook their asocial bullying behavior, which has origin in poorly covered hate of people. They indeed believe himself, they "have a historical mission" - for example the persecuting of "crackpots". What I can see is mentally ill guy - isn't it https://www.faceb...y.Sirak? It is readily apparent Cap'n Stoopid is mentally ill, it's posted all over his wall. It's curious that phys.org doesn't take any action. WOW!! I've been away for several months and come back to see Captain Stupid is still here! Still frantically trying to defend his increasingly dying views! LOL! Captain Stupid, you should give up already and move on to something new. Over the last 3 years of me coming here, I've noticed you are losing ground and support. Especially over the last 6 months or so. there is no way to "lose ground and support"
back to hiding out from reality for you then, eh? If it changes nothing, why are you here? Afraid of something? what does your breeding like rabits not changing anything have to do with my being anywhere? I always find the irony in your posts.